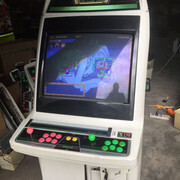 Since it seems like most people interested in Candy Cabs, I've decided on documenting my current purchase of a Candy Cab from Asia. So a few weeks ago, I was browsing eBay, and I came across a New Net City cabinet at the beginning of July this year. I wasn't too sure if I wanted to get this on since I was interested in a Naomi Universal, but at the end I decided to go with it since the condition looked to be very good, and it's very clean from the pictures. No I'm sure I'll get a couple, you paid too much, since these have really gone up in price. I paid $1000 USD for it, I have seen them go for more here in Canada plus, no one is parting from them. There was a promo on eBay, and I did get $100 USD off of the price, so that wasn't so bad. The seller is Yaton, and I'm sure his name is familiar here. 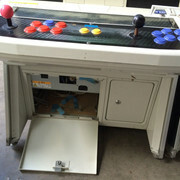 If you don't know, he has been selling arcade stuff for some time now. So in the add, there was note mentioning that they're are have other NNC, NAC and Astro City's available, so I message him and asked about the Astro City. He sent pictures, to me of it. 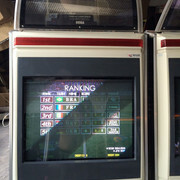 The Screen looks good, and overall the cab is fair to good condition, as these thing are in the 25 year old range, I don't think that it could get better with out restoration. Also it looks like the back part of the cab is painted white. I decided to get that one too. I figured that there are some set cost that are the same, no mater the number of pieces, so might as well have them both come together. So I have paid, and now I'm waiting on them to be shipped. Updates to follow. [Sept 20] Quoted $305 CND for delivery from Dock to Curb. [Sept 27] Unloaded, Customs clearance completed. Last edited by Lordsxo on Mon Oct 01, 2018 2:24 pm, edited 10 times in total. There ins't a full picture of the front. Last edited by Lordsxo on Thu Jul 26, 2018 10:15 am, edited 2 times in total. Good thread. Thank you for taking the time to share your experience. Good luck! Just and update, it's been a month since I purchased them. They are waiting on consolidation into a container for about a week. I'm thinking the end of September now. It's been so long now, I almost forgot about them. Thanks for sharing this... I've bought other things from Yanton in the past most transactions went well. I did have a Naomi2 left out in the rain, they promptly sent a replacement, but it was previously overheated and had internal damage. Several other things from them have worked out fine for me. I was eyeballing a listing similar to yours for some time now. There is also a bulk order for 20 of them. I'll be keen to see how your unit arrives. I chose instead to get a New Net City from "KC" at kcarcade in California. I got my cab in a week, and have been enjoying it since. I have a second cab from KC on the way now (Crazy Taxi). So at this time, I'm in the dark, haven't heard anything as of yet. I don't know where they are at this time. I have sent a request for an update from the seller. I originally figured that they would be here by September, but i'm starting to think October. Got a message from the seller with the his copy of the bill for sending it to me. The tracking for the container shows that it's now in Canada, and is in the rail system, somewhere between Vancouver and Toronto. It should be in Toronto any time between Sept 18 to 25th. With the details provided, I'm going to start to show for freight forwarders. The shipping service that was included with the purchase, gets the two cabinets to the closest port. It's in Brantford, I could pick it up, but I would rather leave it to someone else to do it. It would be a fun experience, but it would like need to be during the day. I could take a day off, but I would like to have an extra hand, and I don't have any friends that will take the day off so that they can slug around two heavy machines. With a freight forwarder, they will pick it up, drive it to my place, and from my earlier inquiries, ether stick it in you garage, or for extra payment, they will remove the packaging, and carry it to any room in your house. I'm just going go with sticking it into my garage. I'll give details and cost of the freight forwarding when I have it. brad808 wrote: I see candy cabs and Brantford. Don't let them linger too long or I'll try to get them into my basement . LOL, they won't spend a night in Brantford, if I can help it. This Monday, I received the Bill Of Lading. It was sent from Hong Kong through DHL from the seller, I didn't know what to do with it at that point, but I figured that it was important, so i stuck it on a shelf. Today, I got a call from the importer that is listed on the BOL, the lady asked for my email, and asked if I had a custom broker. I told her that I was going to self clear, and she asked me if I had the original Bill of Lading. She asked for me to courier it to her office. She super stressed to courier it and not to mail it. I guess it a really big deal if they don't get it or if it's lost. I don't want to find out, so I just as she says. I did some research about custom brokers before this time, all that I spoke with suggested that I should self clear. (It's nice that there are honest businesses, they could have easily done it and billed me for it.) Since the container is being de-canned (I think that is the term) in Toronto, I will be able to clear it in Toronto, even though the container entered Canada in Vancouver. The office that I would need to clear it is at Toronto Pearson Airport. The are open 24/7 so it will but just a hour drive away any time outside of work. After this conversion with the importing company, I go my first surprise invoice in the email that the importer sent me. (No too much of a surprise, as I knew there would be some additional cost to this.) This is my end of the shipping cost, taking my items off of the container, transporting them to a warehouse, handling, security fees, est. This invoice is for $271.51 CDN or $135.76 each, no to bad. Also, I got an updated estimated time time when they will be in Toronto, Sept 28. And I should receive the Manifest plus all the other forms to clear the shipment on or around that day. At this point, I'm going to find a freight forwarder to move the items to my place. damn,, what a process eh? Q B wrote: damn,, what a process eh? It's not too bad so far. It's mostly the waiting, and not knowing exactly what is expected from you and when. It is a good learning experience since I'm planing on importing a car in the near future. So I worked out a delivery the from the warehouse that my cabinets would be held in pending custom clearance. I first priced out the big carriers, but they are super expensive. Fedex Freight quoted me $1180, and DiCom (GoJit) gave me a quote of $1100. I'm about 80 KM from where it is, so it seems really expensive, as I did some browsing before, and I was getting an average of $300 for one, and $400 for two cabinets. I asked the company that owns the warehouse and they quoted me $305 all in, for both cabinets delivered to the curb. It beats renting a trailer, driving down to Toronto and back, and buying lunch for someone to help, and having them take the day off work. This cost is the only convenience cost so far, as I could have gotten it myself.